A few weeks back, Uganda Revenue Authority froze Eagles Productions accounts in Centenary Rural Development Bank after it discovered that the band members had evaded taxes for long. The tax body is now closing in on other top artistes like Bobi Wine, Bebe Cool and Jose Chameleone who could lose some of their property as the tax body tries to recover the taxes the singers have not remitted in the various shows over time. The artistes have not paid Value Added Tax (VAT) on their album launches and concerts. According to a source from URA; "Chameleone is in trouble because he has so far refused to clear the Shs9m dues for the Valu Valu album launch alone. A notice ordering him to pay it as soon as possible has also been sent to him." Bebe Cool and Bobi Wine have not yet paid taxes on the recent successful Battle of the Champions that was held at Kyadondo Rugby Grounds. 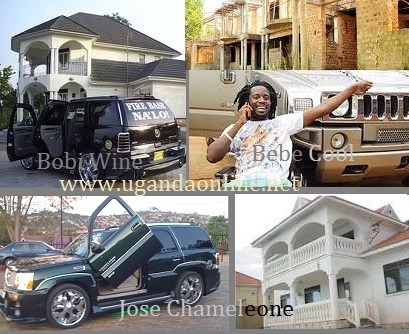 The artistes have to clear their dues very soon or else URA could attach their posh rides, mansions and land titles.